Description Although he trained in the studio of the celebrated Neoclassical history painter Jacques-Louis David (1748-1825), Ingres defies easy classification. This intimate painting reflects Ingres's Romantic fascination with the lives of artists of the past whom he admired-in this case, Raphael. 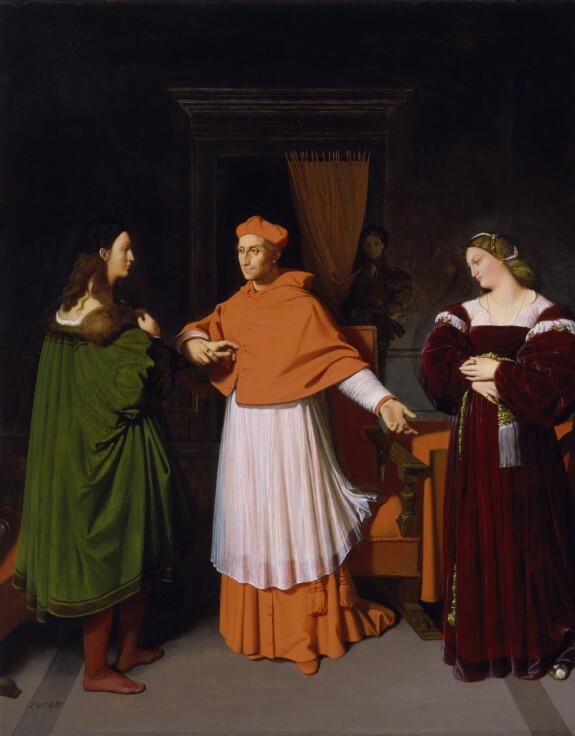 In this scene, Cardinal Bibbiena presents his niece as a bride for Raphael, a demonstration of the extraordinary esteem the cardinal felt for the handsome young artist. Ingres was careful to use historical sources in his imaginative depiction of this pivotal moment. Raphael's features are based on a portrait of a young man that was once thought to be a self-portrait (National Gallery of Art, Washington, D.C.); Bibbiena's likeness is based on a portrait by Raphael (Pitti Palace, Florence); and the cardinal's niece was inspired by Sebastiano del Piombo's image of a woman once identified as Raphael's mistress, called "La Fornarina" (also in the Pitti Palace). 1/11/1982 Examination examined for condition. French Master Paintings from Baltimore. Baltimore Museum of Art, Baltimore; The Walters Art Museum, Baltimore. 2001-0. Millet and Barbizon Art. Matsumoto City Museum, Matsumoto City; Tokuyama City Museum of Art and History, Tokuyama; Kasama Nichido Museum, Kasama City; Ishikawa Prefectural Museum of Art, Kanazawa. 1996. Ingres in American Collections. Paul Rosenberg & Co., New York, New York. 1961. Ingres et son Temps. Musee Ingres a Montauban, Montauban. 1967. From El Greco to Pollock: Early and Late Works by European and American Artists. Baltimore Museum of Art, Baltimore. 1968. Raphael et l'Art Francais. Galeries nationales du Grand Palais, Paris. 1983-1984. Raffaello: elementi di un mito. Biblioteca Medicea Laurenziana, Florence. 1984. De la scène au tableau. Musee Cantini, Marseille; Museo di arte moderna e contemporanea di Trento e Rovereto, Rovereto (TN); Art Gallery of Ontario, Toronto. 2009-2010. Provenance Caroline Murat, Queen of Naples, 1813, by commission; Duke of Salerno [date and mode of acquisition unknown]; Prince of Salerno Sale, Naples, April 19, 1852, no. 118; Collection Giuseppe Tibaldi, Naples [date and mode of acquisition unknown]; Ch. Blanc Sale, Paris, March 13-15, 1882, no. 33; Collection L. Tabourier [date and mode of acquisition unknown]; Mrs. S. D. Warren, Boston [date and mode of acquisition unknown]; Mrs. S. D. Warren Sale, American Art Association, New York, January 8-9, 1903, no. 52; Henry Walters, Baltimore, 1903, by purchase; Walters Art Museum, 1931, by bequest.